It is nearly entirely to the credit of an outstanding Julianne Moore and a commendable supporting cast that Still Alice does not fall into the TV-movie-esque pool that it so nearly ends up defining itself as at times. Indeed, even many scenes where restraint and subtlety are indeed achieved seem to have bombast boiling just under the surface. But Moore does very well, and so do her castmates. The intentions behind this movie are noble, and I admire screenwriters and directors Richard Glatzer and Wash Westmoreland’s effort to take a delicate subject such as Alzheimer’s disease, and put it on the big screen. And don’t get me wrong, I liked what came about, but there were certainly times where I couldn’t help but feel that there was still a little but more left. Moore portrays Dr. Alice Howland, a renowned linguistics professor at Columbia University. She has been happily married to her husband John (Alec Baldwin) for decades, and they have been parents to three children, now well-adjusted adults navigating their own lives: Anna (Kate Bosworth), Tom (Hunter Parrish), and Lydia (Kristen Stewart). But Alice has been noticing some problems with her mind lately. First, it starts with forgetting words or sentences in a lecture she’s giving. Then, she gets lost while jogging on the Columbia campus. And it keeps coming in waves – she introduces herself to Tom’s new girlfriend at Christmas dinner, forgetting that she had done so only minutes prior, information told to her earlier in the day slips her mind entirely, and other tics develop that slowly become more serious. She sees a neurologist (Stephen Kunken), and is diagnosed with early onset Alzheimer’s disease. This comes as a massive blow – Alice is only fifty years old, and at the height of her professional success. Even worse, the condition is familial, which means that she has passed it on to at least one of her children. Alice must now increasingly rely on her family and others, as traits such as independence and mental ability, which were so vital to her and her work, begin to rapidly fade away. One of the remarkable things that Westmoreland and the recently passed Glatzer achieve, despite a sometimes overly-standard handling when adapting the source material (a novel of the same name by Lisa Genova), is showing the progression of a mental disease from the perspective of the sufferer. 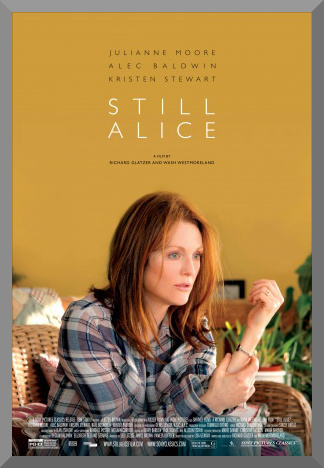 Still Alice is a very personal movie, where we as viewers are forced to identify strongly with our main character – we don’t have the option of being a simple observer. It’s uncomfortable and difficult to watch at times, especially during scenes like when a plot device arises in which a recently-diagnosed Alice records a video containing devastating instructions for her future self if things should get too bad. It’s wrenching, and as the movie widens its scope, showing the physical and emotional toll that this disease takes on Alice’s family, especially John and Lydia, it serves as a gripping and painful depiction of how in real life, conditions like these affect a far greater number of people than the individual who has it. You have to admire Julianne Moore for taking on a role as challenging as this. Allowing yourself to portray a character who falls apart little-by-little must be one of the most vulnerable things that exists in the field of acting. And while her transformation isn’t as physical as Eddie Redmayne’s in The Theory of Everything, early scenes in which Alice begins to realize that something may be deeply wrong are played by Moore with such quiet realism that her achievement is arguably more towering in many respects. Alec Baldwin is stellar as John, a man who fully supports his wife, but worries what disparities the future holds. However, I feel the strongest performance in the supporting cast was that of Kristen Stewart as Lydia, Alice and John’s youngest daughter. As her role increases more and more throughout the 101 minute runtime, Stewart is able to stand her ground with her more seasoned co-star, and handles the material given to her in impressive ways. Yet there is something that keeps me from liking Still Alice more than I would have otherwise. While I fully acknowledge that some of this could have been an issue from Genova’s novel (I have yet to read it, although I would certainly like to), I felt like the movie, despite all of its effort from the cast and outlook, still had a vague tint of a “TV movie” feel. What I mean by that is how sometimes the heavy emotional drive comes off as artificially induced – moments where Ilan Eshkari’s string heavy score threatens to grow so large that it nearly pops off the screen and becomes its own symphony and a certain sense of wallowing in Alice’s disease rather than exploring it (her episodes often serve as transitional devices from scene-to-scene, act-to-act) serve as the making of frustrating roadblocks which keep greatness from fully pulling through. But I don’t want my criticisms to come in the way of the fact that I believe that this is a compassionate film about a sensitive subject, made very carefully and clearly done with great intent from talented people. In a film climate where tough content like this is often ignored by many, it’s wonderful whenever an influential cast and crew come together and make something like this. “Comforting” may be an inappropriate descriptor, but I have a feeling that in the months and years to come, Still Alice will have a very profound effect on many who know someone afflicted with Alzheimer’s or other debilitating illnesses, as reactions from its theatrical release have proven. It’s a very good thing that this movie was made, for as long as such a tragic and ravaging disease exists, its meaning and impact will carry a stinging poignancy.